A large focus of our analysis currently is on two-sided business model for operators. We recently explored the opportunity for ‘Broadband Service Providers’ (fixed and mobile) from an access and delivery standpoint (we estimated a $250bn opportunity in 10 years time in mature markets alone…subject to some significant change in the industry) and are now researching how operators might build a portfolio of value-added platform, services that build on their early activities in advertising. As well as identifying key platform opportunities and strategies and sizing the market, part of our work has involved looking at existing two-sided plays within and outside of Telecoms. Of course, the two-sided business model is not entirely new for Telcos. Fixed players have long since provided Freephone (often 800 numbers) to enterprises wishing to attract consumers. Benefits accrue to both parties - consumer pays nothing for call and the enterprise increases the volume of inbound calls. The normal business model is reversed and the enterprise is charged for receiving the call. This is akin, in the Telco advertising model, to the advertiser paying for a click on a banner or for a response to a short code promotion. 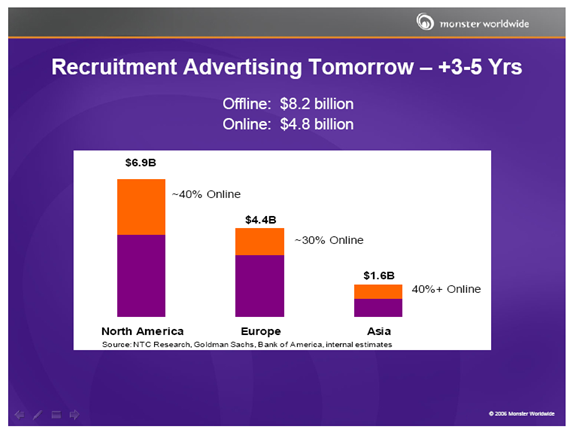 One company we have explored is Monster Worldwide which has come to dominate the on-line recruitment market. Overview Brings job seekers and advertisers together by providing listings of jobs for prospective candidates to search and a CV list which employers can search for suitable people to fill their jobs. Also provides advertising space on the portal and newsletters. Business Model Charges employers for listing jobs, searching CVs and placing ads - their need and willingness to pay is high. All services free to job seeker - could be unemployed and price sensitivity is high. Pricing (US) By City/State in US - single listing in New York City is $395. CV Search is $10k/annum for 20k searches or US$1.8k/month for 1.5k searches. The company has grown from humble beginnings to the undisputed number 1 online employment solutions provider. Back in 1994, a small employment company called Adion developed a facility whereby job seekers could search job database using a web browser. Initially, the site was populated with job descriptions from the newspaper segment of Adion’s business with the permissions of the companies advertising the jobs. By December 2005 Monster Worldwide was part of the NASDAQ 100 (joining the same time as Google). 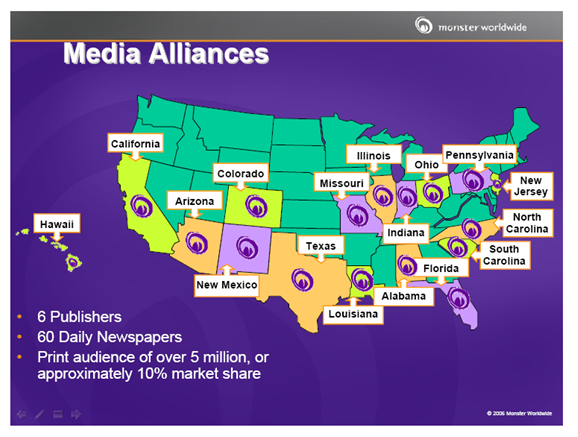 Monster’s strong on-line presence in US has resulted in the company leveraging its brand through off-line partnerships with publishers of printed journals and newspapers. This dual on- and off-line strategy looks set to continue with expansion into European markets likely in he next few years. The offspring can sometimes grow larger than the parent. Monster was a small off-shoot of a recruitment agency but grew to engulf not only its parent but its parent’s parent after Adion was acquired by TMP. A two-sided play which currently looks insignifcant (and likely to cannabilise the core business), just might be a whopper in 10 years time. Business model and pricing strategy is critical. Employers have money and a stronger need to get the right person for their job. Making the service free for candidates built scale fast (making employers more willing to pay - Monster charges a premium over other on-line recruitment platforms). This was similar to Google with search - free for searchers to build scale, then charge advertisers for access to them. Operators have an existing (paying) customer base and need to think long and hard about the best pricing strategy for both customer sides (service provider upstream and end-user downstream). You don’t have to be an internet player. Monster is looking to extend its on-line platform play into traditional off-line media (magazines, TV, etc.). Operators have an opportunity to compete with a similar dual-channel strategy with, for example, marketing and advertising enablers being used to support on-line and off-line campaigns.